Juuling and vaping has quickly become one of the newest forms of addiction for teens. We’ve seen kids vaping in various areas throughout our county. 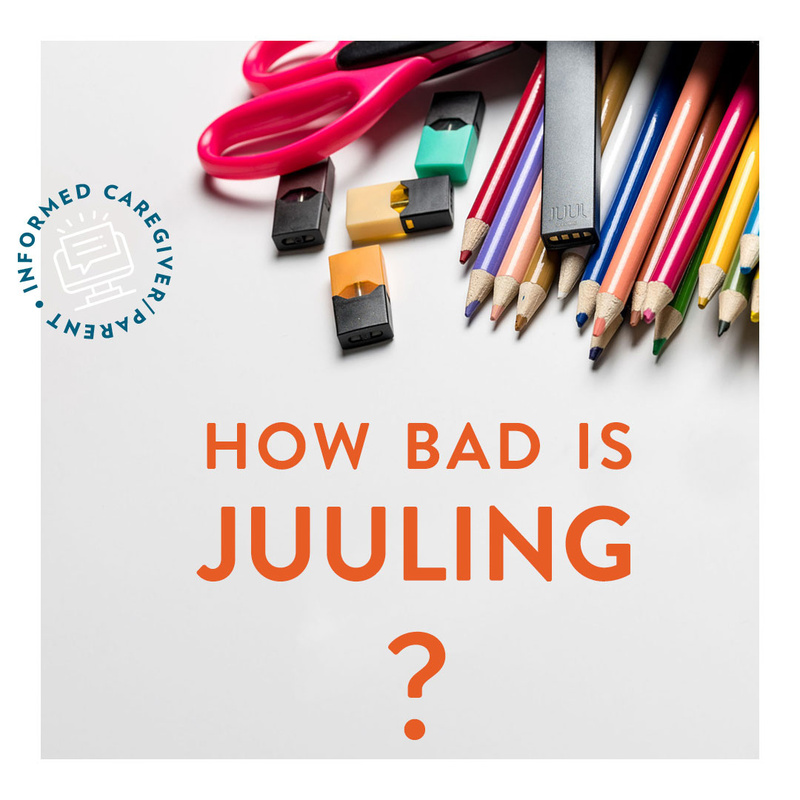 Granted we’ve seen adults just as well as teens vaping, however, the number of children that are Juuling is growing at an alarming rate. When we were in school in the 1970s/1980s, there were kids who smoked and who did other things. As parents we all know that our kids will try something they shouldn’t have because their peers have/do it. Sure, we can try to threaten them to never do it; however, like everything else, when we threaten them, we know it only makes them want to try it more. So, what are parents to do if you can’t threaten them? Educate, educate, educate not only in our homes but in the schools and the news. Children who use any form of e-cigarettes have a 30% higher chance of smoking traditional cigarettes within the next six months of initial use. A 2017 report from the CDC found that 3 out of every 100 MIDDLE SCHOOL students and 12 out of every 100 HIGH SCHOOL students reported the use of electronic cigarettes. According to this study, electronic cigarette use has been found to be higher among boys. In 2015, statistics showed that 6% more boys then girls used e-cigarettes. One JUUL pod contains around 20 CIGARETTES worth of Nicotine, which is an equivalent of up to two packs of traditional cigarettes. JUUL pods sold in the U.S. contain THREE TIMES THE NICOTINE PERMITTED in the European Union, so the company has had to literally adjust its nicotine amounts to comply with the European Union Tobacco Products Directive. Each JUUL pod contains 40 mg of nicotine; according to the American Academy of Pediatrics, this is DOUBLE the concentration of nicotine found in other e-cigarettes. WHY IS JUULING BECOMING SO POPULAR WITH TEENS? E-cigarettes go down smoother due to the lack of tar and other harmful substances that traditional cigarettes contain. Of course, like with everything, it’s becoming so popular because it’s the “IN” thing right now. The e-cigarettes look cool and it’s the newest thing. WHAT ARE THE INGREDIENTS IN JUUL PODS? Nicotine: Nicotine is a chemical found in the leaves of the tobacco plant and equals anywhere between 0.6% and 3.0% of the dry weight of tobacco. Any form of nicotine and tobacco are highly addictive, especially for adolescents and even the smallest of doses can impair your health. Glycerin: Normally this compound is safe for adults since it’s a naturally occurring colorless, odorless liquid chemical. It’s non-toxic and sweet-tasting which contributes to the various flavors of the pods. Extracts and Flavor: Did you know that the specific ingredients of this additive are NOT shared publicly by JUUL, however, a 2018 study in Pediatrics found that tobacco and fruity e-cigarette flavors contain high amounts of cancer-causing chemicals. Benzoic Acid: This ingredient is commonly added to food and beverages as a preservative. While the FDA has not officially deemed benzoic acid safe for consumption, it is used frequently in the manufactured products to inhibit the growth of both bacteria and fungi. Propylene Glycol: This is an odorless, colorless, synthetic liquid that helps absorb water. The FDA has deemed this chemical as an additive that is “generally classified as safe,” but there remains a need for additional research to determine its effects on humans. However, studies analyzing the health effects of glycol-based theatrical fog have been linked to acute and chronic respiratory effects. Let’s talk now about what the side effects of Juuling are. There are not just short-term BUT long-term effects of vaping/JUULing. Just as like with other nicotine use, there are side effects that our children will be dealing with. WHAT ARE IN JUUL PODS? If you have teens you already know that showing them the above information isn’t going to get them to quit juuling/vaping. Sure, you can yell, threaten, get upset in your effort to get them to quit, however, we need to educate them. We need to ask questions as to “who, what, where, why”. If they don’t have a job, where are they getting the money from? Who is buying it for them since they have to be 18? We can win this battle with vaping/juuling. We need to continue to not only educate ourselves BUT ALSO our children about the dangers of vaping that aren’t so “COOL”. We talk very openly with our teen about vaping, the consequences that she will face, and we encourage her to keep saying “NO”. Here is an eye-opening infographic that I think will provide a lot of information. Make sure to share this information as well as this post with your friends on social media. We can’t stop vaping by teens, but together, armed with the correct information, we can educate our children. Granted they may not WANT to listen, but we still have to try!